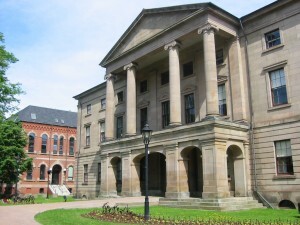 Prince Edward Island is Canada’s smallest province both in size and population. It sits cradled in the Gulf of St. Lawrence just off the coasts of Nova Scotia and New Brunswick. PEI is famous for red sandy beaches, Anne of Green Gables, and potatoes. It is the only Canadian province without a synagogue. So, no surprise that there are no kosher resources to speak of. However, in downtown Charlottetown, the provincial capital, there are two strictly vegetarian (no hashgacha) Chinese restaurants that one might consider: Tai Chi Gardens and Splendid Essence. They are both attractive, moderately-priced and tasty, but Splendid Essence has a larger menu, good lunch specials and a nicer ambience. Both are very casual, located in converted houses in residential neighborhoods. Sadly, the popular Cow’s ice cream chain is not under any hashgacha. Of course you can find packaged kosher-certified goods at any supermarket. Prince Edward Island is accessible via a long bridge from New Brunswick, ferries from Nova Scotia or limited air service at the tiny airport just north of town. Charlottetown is a very small, delightful, walkable city. It has a cute waterfront entertainment area, historical government buildings and homes, shady streets, gardens, and a first class arts and theater complex. Confederation Hall is the capital building but is also a museum that tells the story of the Canadian road to independence from Great Britain, with historical items, multimedia presentations and dramatic reenactments. 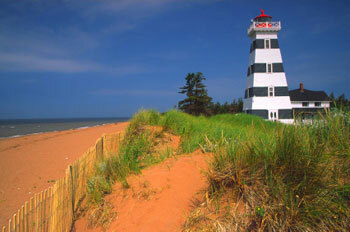 The northern coast is a string of uncrowded red sand beaches that comprise PEI National Park. Swimming, biking and hiking are very popular activities. The waters are considered warm by Canadian standards. The island is the home of the fictitious Anne Shirley, and the Anne of Green Gables theme is everpresent on the island. The Confederation Centre of the Arts puts on an excellent musical of the story every summer. All over the island are small towns, scenic vistas, farms, antique shops, fruit stands and low-key places of interest. The roads are good and well-marked. There was never any traffic. ; The people are friendly and welcoming. PEI is a little off the Jewish travel map, but can make for a very relaxing and interesting visit.